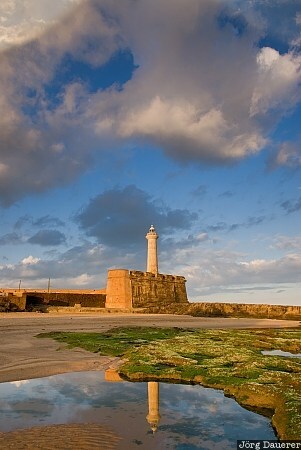 The lighthouse of Rabat (Phare de Rabat) at the Atlantic Ocean and its perfect reflexion in a calm tide pool illuminated by the first light of the day. Rabat is in Rabat-Salé-Zemmour-Zaër, Morocco. This photo was taken in the morning of a sunny day in March of 2010. This photo is part of the exhibition Lighthouses (February 2010). This photo was taken with a digital camera.